Ollands Farm Barn was built in approximately 1709, about 30 years after the farmhouse. It has been lovingly restored to a very high standard and features beamed, vaulted ceilings, wood burning stove, central heating, quaint (but steep!) paddle stairs, comfortable king-size bed in the galleried bedroom and a fully fitted kitchen and shower room with a charming and secure courtyard area. Parking is off road on hard standing and just outside the small barn yard in the picture. Access is through a wrought iron gate in the wall. You may, at this point, be very distracted by some wonderful smells floating out through the door of the building just in front of the parking, where preparation of a whole range of preserves will be taking place by the award winning Ollands Farm Foods! Kitchen: The kitchen is fully fitted and equipped with cooker, microwave, dishwasher and fridge. Tea towels, oven glove and apron are all provided. On arrival you will find a pint of milk in the fridge and tea, coffee and various other lovely goodies (including Ollands Farm Foods products!) to refresh you after your journey and get you started on your holiday. Living Room: In the main living area of the barn come and sit on the comfortable sofas, one of which converts to a double bed. The floor is warm and wooden, and there is an antique dresser plus a dining table to seat four. Evenings can be spent watching the TV with satellite and CD/DVD with surround sound home cinema system and a small library of DVDs to choose from. If you are more of a reader then you might enjoy the small library and a range of walking and local information books to help you make the most of your stay. And of course there is free wifi! Up the steep paddle stairs to the …. Bedroom: The stairs are easy to use once you have tried them! You go up and down as normal but it is not recommended that you try to turn round and go the other way half way up or down! If you have a dog, it is unlikely he or she will be able to manage them. You will see that the ceiling is very low – so please mind your head! The galleried bedroom is open to the living area and so, although there is a comfortable sofa-bed downstairs, the accommodation is really more suited to a single couple or small family. Downstairs Wet room: In our brand new state-of-the-art wet room you will find fluffy towels, luxury bathrobes, Molton Brown toiletries including aromatic shower gel, soothing hand wash and silky smooth hand lotion. Outside areas: The back door from the kitchen leads directly to the covered veranda and private, secluded garden. The courtyard outside the main doors is shared with the main farmhouse and this is where the owners live but the rear Barn garden is totally private and secluded. It features wildlife pond, flower and shrub borders, rose arches and a range of climbing plants with a strong emphasis on fragrance. The flowers you find in the barn on your arrival are all grown in the gardens of Ollands Farm. Both the flint-walled courtyard and pretty garden at the rear are secure and dog friendly. Please ask us for more information if your dog is an escapee! Please note – there is no land line telephone for the Barn. Tesco, Sainsbury, Asda and Waitrose all deliver to the Barn, so if you want to arrange for a delivery on the day of your arrival, just let us know and it will be put away for you. A selection of walking routes/books, recommendations on places to eat, shop, takeaways etc. “Thank you so much for another fantastic week. This is our little bolt hole and we can’t wait to see you again in September”. Or – From Stalham, take the – B1159 towards Bacton and Happisburgh. After approximately 1 and 1/2 miles, look for a right-hand turn signposted Happisburgh. Follow this winding road for approx 1/3 mile to a T-junction opposite Whittleton’s Farm. Turn right and continue about 1/2 mile to another T-junction. Turn left and then left again in about 200 yards into Short Lane, a very narrow lane. You will find Ollands Farm and its barn on the third corner with parking alongside the wall of the barn yard. Very comfortable stay in this lovely barn. The welcome pack was most appreciated by us all. The beach at Sea Palling was just fabulous and we were very lucky to have a week of sunny weather. Great food at The Star Inn, Lessingham though suggest you ring to book as it gets very full but when you sample the food, you know why! Lovely relaxing place to stay. We really enjoyed exploring the local area and amazing beaches which are so close to your lovely barn, just wish we had longer here. The Old Rectory Gardens were just stunning and so close which was just perfect as we were only here for a short break, Thank you so much for the welcome box and for helping us with our dog 'Marnie', she is definitely on the mend faster due to your kindness. Thank you once again for letting us and our 7 furbabies stay in your beautiful barn, we had a lovely relaxing stay and look forward to our weeks holiday next year. Happy New Year!! Thanks to Kim and Mary Ann for another lovely stay. Thank you for a lovely stay. It was great to get away from the hustle and bustle of life. The contents of the hamper were quiety devoured and the dogs enjoyed their treats. Sadie and Ralph have loved their first walks to the beach and then returning to lay in front of the woodburner. The barn is a lovely place and thanks for all your hard work in making our stay so memorable. Our second holiday at the Barn and it wasnt to be our last! We revisited some of the places from lst time and have found some new ones! Highly recommend Sheringham Park, Sea Palling beach, the Star Inn at Lessingham and of course, Happisburgh (Smallsticks cafe too). Thank you Kim and Mary Ann. See you again. Thank you for such a wonderful, relaxing and peaceful holiday. A stress free zone. The four greyhounds have enjoyed it too. The Greyhound pub at Hickling welcomed us and the greyhounds we had with us into the pub and we had a lovely meal. We were very lucky with the weather and enjoyed your serene garden. Dear Ladies, Thank you for making us feel truly welcome, relaxed, comfortable and at home from the start. This was our first holiday with dogs in tow and we were a little apprehensive to say the least but it was a total success. Jet and Ferugs took to their holiday home like ducks to water. This beautiful barn is everything we could have wished for. The welcome pack a real treat and all the little extras fabulous. The really special part was the 'Ollands Pack', thank you for letting us spend time with these beautiful animals. We will be back. We've had a very enjoyable week here at Ollands Farm Barn. Kim and Mary Ann were very helpful and welcoming. Luckily the weather was good all week, and the accommodation is very good. We haven't been to this area before but were pleased with what is here. All being well, we'll visit again. One week of bliss (not the weather!) What a special place to be – a true 'Shangri La'. Must be unique – our 4 boys just settled as if at home. Wonderful coast line with space to walk and fun for dogs – no crowds here. Lovely ladies who manage the barn instantly made us welcome and nothing would have been too much trouble. Only decision left – which dates for next year? Thank you for a lovely holiday. Our two dogs enjoyed the garden and exploring. Visited some lovely little villages and beaches. Sea Palling being a favourite. Very dog friendly and secluded from the wind. First time visiting Norfolk and will definitely be returning. The Barn has everything we needed. Thank you again. Thank you once again for a perfect week, its so lovely to come from all the hustle bustle to your little bubble of heaven. We did exactly what we planned to do (nothing) and we couldnt have had a better week! Us and the dogs all have a tan!! Cant wait to book in for next year already, really do make us and the pack feel right at home. Thank you. W ishing you all the very best till we see you next. Thank you Kim and Mary Ann for making us feel very welcome. Log burner was very welcome in the evenings. Dogs enjoyed all the walking they have been asleep since we have been home. Loved the complimentary Home made goodies. Bread, Jam, Shortbread, Chocolates and the dogs loved the liver treats all made on the premises. A lovely break, in a lovely location. We really enjoyed our break again. Slept well in the fantastic bed. A very relaxing week. The weather was brilliant so lots of long walks under the trees at Bacton Woods. Having a lovely garden to sit out in and read of a warm evening – super. Dogs enjoyed the beach runs. Thanks very much. Fran and Cliff and the dogs. We had a lovely time! The homemade bread and goodies were delicious. The dogs loved their treats too. The Star Inn is a little gem. 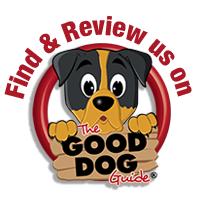 Excellent food and very dog friendly, it's highly recommended – booking advised. We’ll be back. Once again a very relaxing lovely few days. Really enjoyed our time with you both. Hope to see you in the summer. Thank you.